My Grandma's recipes were very famous among relatives, friends and in our neighborhood. But I don't have much memory of her cooking; all that I remember was that she used to give instructions to daughter-in-laws and the maid. Theeyal was her favorite dish and the one made with bitter gourd and green mango was a usual thing at my grandma's house. Her legacy of Theeyal is continued by her daughter-in-laws including my Mom (because my Dad loves it :)..). My Mom experiments this South Indian, typical Keralite dish with the vegetables that are available here. She has few good versions apart from the traditional ones, but she always makes this Asparagus and Shallots version when we visit them as Nathan loves Theeyal. 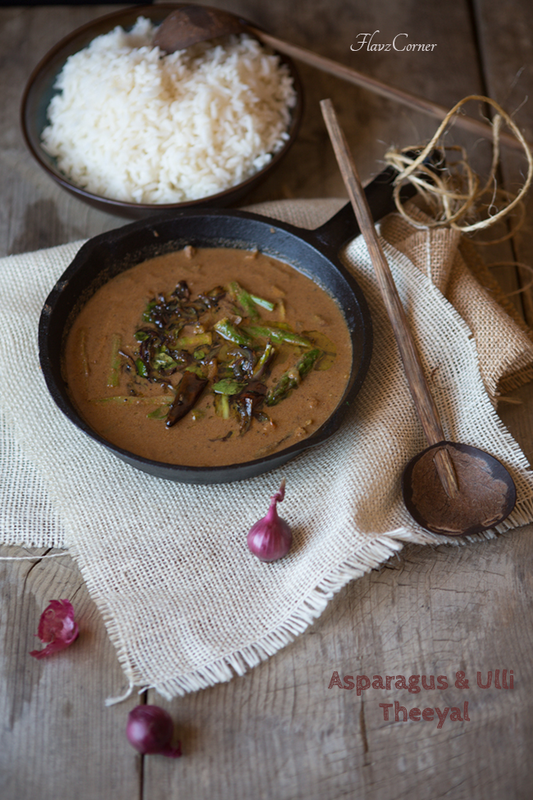 Typically Theeyal is made with certain vegetables cooked in roasted coconut gravy along with shallots. The roasting of coconut with some spices imparts the distinct flavor to this dish which can vary from light brown to dark brown in color. I prefer my Theeyal to be medium brown than dark brown. Over roasting of coconut will tend to give a burnt and bitter taste for Theeyal, so I try to avoid burning the coconut by roasting it in very low heat. Due to the lengthy dry roasting process, I only make Theeyal during Onam or lent season. Theeyal when served with a steaming bowl of par boiled rice and some buttermilk seasoned with ginger, shallots, green chili and curry leaves (Pacha Mooru) is something I could eat everyday. Theeyal is one of the main dishes of Keralites vegetarian feast (Sadhya). 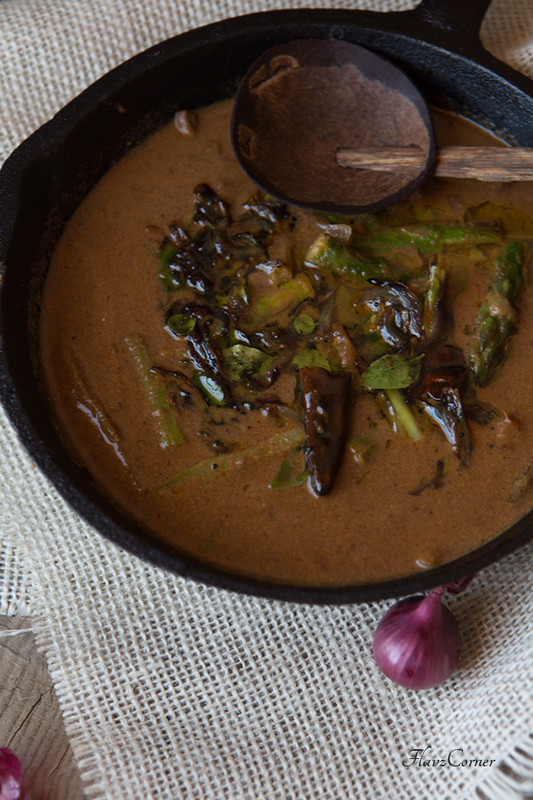 Here is the Asparagus and Shallots Theeyal recipe that my Mom makes. 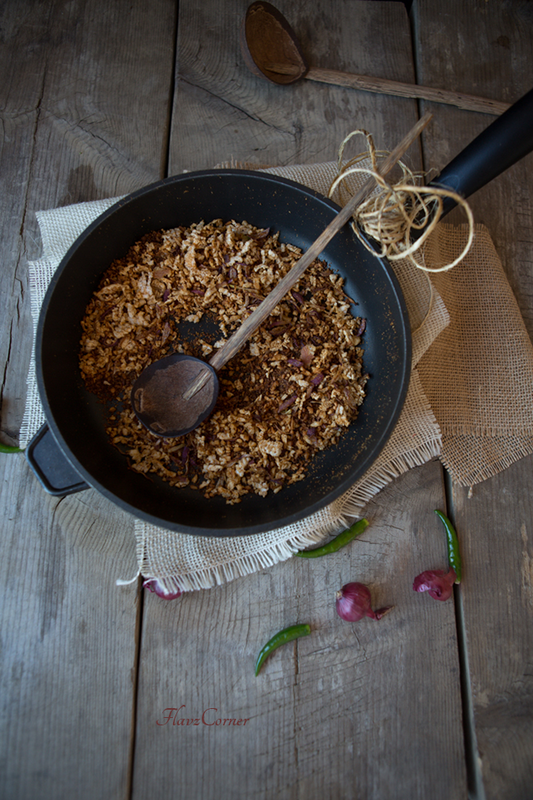 Dry roast the grated coconut and sliced shallots on very low heat in a cast iron pan or non stick pan for 15 - 20 minutes or till the coconut turns medium brown as shown in the picture by continuously stirring. Add the coriander powder, chili powder and fenugreek powder and roast for 2 minutes on low heat. Turn off the stove and let it cool. Grind the dry roasted ingredients with 1/3 cup water into a smooth paste. Soak the tamarind in 1/2 cup luke warm water. Once soaked well, strain the pulp and save it. Wash the asparagus and pat dry with kitchen towel. 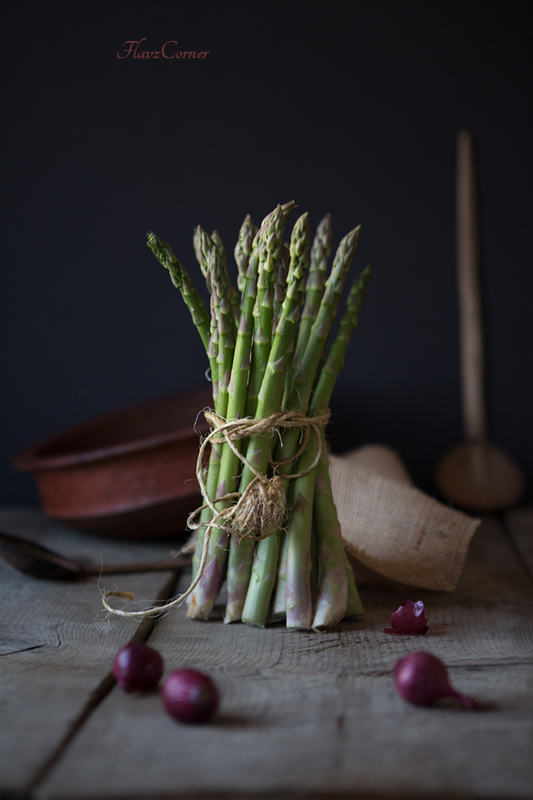 Cut the wood stem of the asparagus and discard. If the stem is too thick, split them into half and cut them into 3 cm long pieces. In a non stick wok or deep pan, saute the asparagus with shallots and green chili in 1 1/2 tsp oil till the asparagus is cooked but still have the green color for 2- 3 minutes. Add salt to taste. Remove the asparagus from the pan and keep it aside. Add 1 tsp of oil to the same pan and saute the cubed tomato for 1 minute. Now add the coconut paste and tamarind juice without the pulp into the pan. Add 1/4 -1/2 cup of water if the gravy is thick. Add the sauteed asparagus-shallot mix to the pan and cook till gravy boils for 2-3 minutes. Adjust the salt. Turn off the burner. If you don't have a good blender, use a spice grinder/clean coffee grinder to grind the warm dry roasted coconut till its powdered well and the ground coconut starts to stick to the sides.. Now transfer this into a blender and add enough water to grind it into a smooth paste. What a scrumptious recipe and gorgeous photos! The coconut gravy sounds fantastic! I don't know whether I like the recipe or photos better! Good thing I can have both. ;-) This is wonderful -- thanks so much. Beautiful photos. Love the combination of the colors. I love it!